So many people like Our Watercolor Wednesday artwork, that We’ve decided to make things like cards and calendars available for sale. See one you like? Just let me know. Send me an email: StuartTheScottie@hotmail.com. Browse around through the archives to see more. 10 Responses to Like Watercolor Wednesday? I love the Stu ART on watercolor Wedsnesday and love reading about your daily adventures and Scottie things that you do. I am soooo glad your peeps found you and that you’re living a very good life with them. Your peeps are very talented with the artwork of you!! 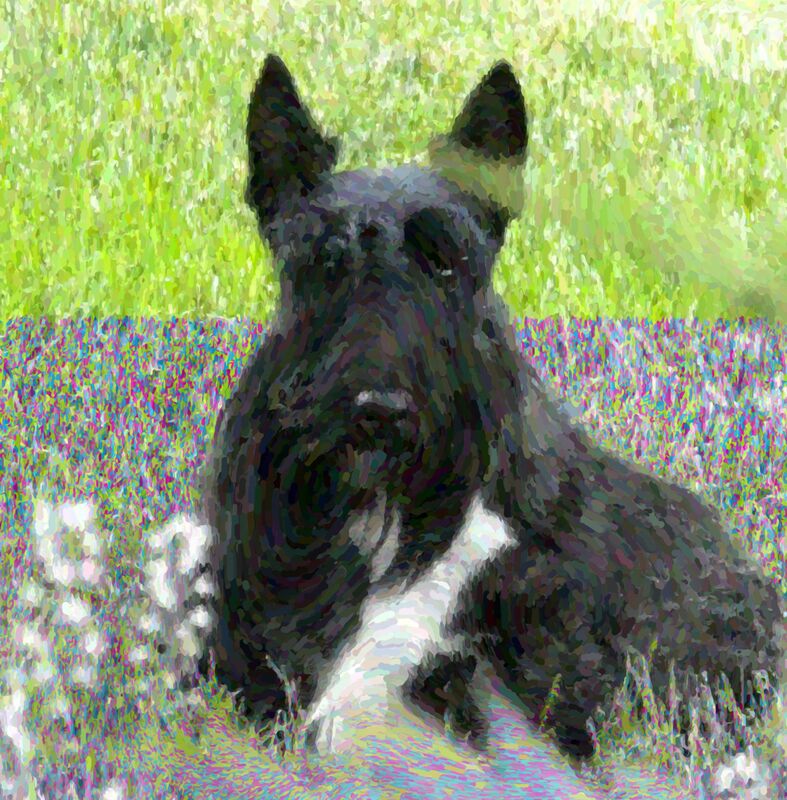 You went from being a very cute scottie puppy to grow up to be a MAJESTIC,HANDSOME adult scottie!! You can Bark Out Loud about that!! Keep a Postin’ and I’ll keep reading!! Love Ya Stuart !!!!!!!! P.S. I like your White Patches!!!! You are SOOOOO kind Donna! Many thanks and ArroOOOOOs to you for your nice comments. We appreciate your stopping by and leaving us a pee mail. I am Chloe….an almost two year old brindle Scottie….my white markings are on my tail. They were much more evident when I was six months old. Do you have a photo of yourself freshly groomed? I have found Scottie hair cuts are mostly personal taste. We are still undecided in terms of a bit of a skirt, and the jury is still out on the length of my beard. I am asking all my friends for photos so as to assist in my decision. Yes. I’ve posted a few photos here on the blog of moi freshly groomed. I love a long skirt and a long beard and fairly long eyebrows. The ability to have a full, long skirt has a lot to do with your coat. And maybe some genetics, too. My predecessor, BoBo, was never able to grow a long, full skirt. He just didn’t have the coat for it. His mother was a puppy mill product and wasn’t taken care of properly and her mother wasn’t either. No thick, full coat for them poor things. Sniff around in the archives and see what you can find in the way of pictures. There’s one called “Before and After” dated from September 11, 2012. There are a few more showing my glorious self after grooming. You are so kind to pop by and write! We must be three peas on a pod, yes? It’s nice to share things and I’m envious that you lived in Bermuda. Hi, my Scotties name is aggie and she has a problem with playing ‘too rough’. Any advice? Hello! Thanks for stopping by and barking at The Scottie Chronicles! If Aggie is a puppy, it’s normal to play rough. Especially if she’s got litter mates who play rough back! They tend to teach each other and put each other in their place. If Aggie’s not a puppy, she needs you to teach her what’s acceptable and what’s not. Don’t tolerate bad behavior and praise her when she’s good. When she starts roughhousing too hard, stop her. Pick a word – other than “no” – and say it strongly every time you want her to stop. Something like, “Aggie, gentle” or “Aggie, calm.” How old is she?